This beautiful doily came from a vintage crochet pattern book called “Suggestions for Fairs and Bazaars” Just guessing at the amount of time this lovely doily would take to make I hardly think any of us crocheters would spend all that time making it to sell at a fair! Luckily we have come a long way since 1953 when this book was printed. 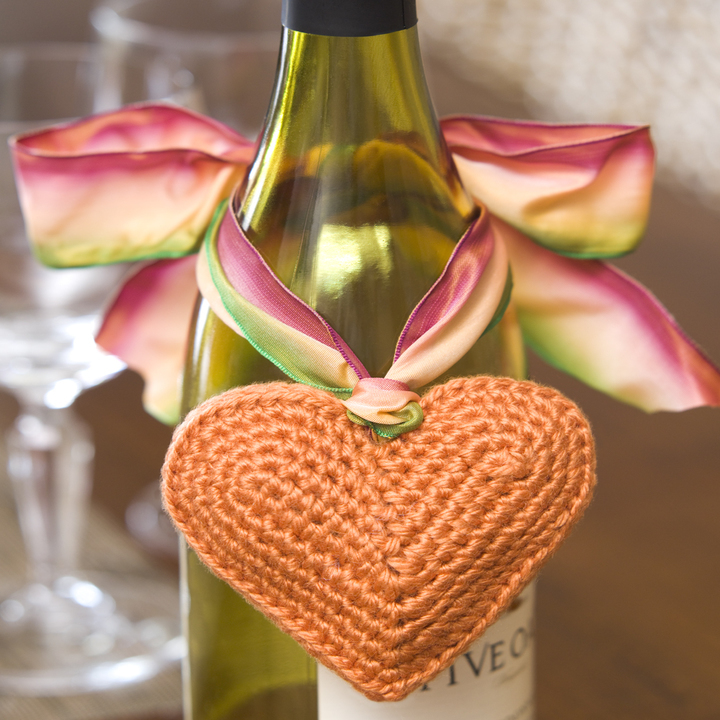 This piece would be destined to be a family heirloom, especially since it is crocheted using a steel crochet hook and crochet cotton thread. 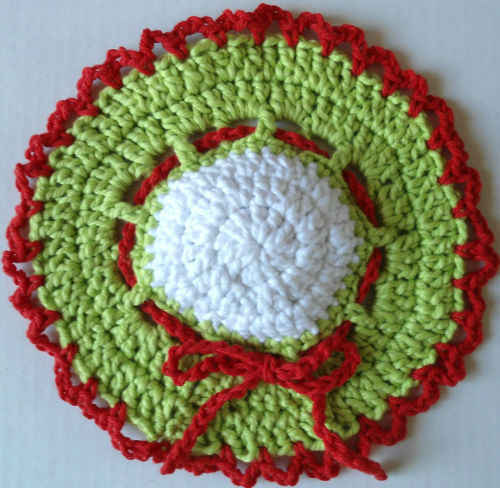 Additional pieces including oval shaped Ruffled Rose Hot Mats that could be used as doilies and a Ruffled Rose Napkin holder that could be converted into a potholder for your kitchen will be posted in a couple of days. Shell1: (Dc, ch 3, dc) in same st or sp indicated. Shell2: (2 dc, ch 3, 2 dc) in same st or sp indicated. Rnd 5: * Ch 6, working behind petals, sl st between next 2 petals; rep from * around. Finish off Shaded Yellow and weave in ends. Rnd 6: With right side facing, join Green with sl st to any ch-6 sp, (sc, dc, 7 tr, dc, sc) in same sp; * (sc, dc, 7 tr, dc, sc) in next sp; rep from * around; join. (8 Leaves) Finish off Green and weave in ends. Rnd 7: With right side facing, join White with sc to 2nd tr of any Leaf, ch 5, skip 3 tr, sc in next tr, * ch 3, tr between Leaves, ch 3, sc in next tr; rep from * around, ending with ch 3, tr between Leaves, ch 3; join. Rnd 8: Sl st in ch-3 sp, ch 6 (counts as first dc and ch 3), dc in same sp, (Shell1 in next sp) around; join with sl st to first dc. Rnd 9: Sl st in center of Shell, * ch 6, sc in center of next Shell; rep from * around. Finish off White and weave in ends. Rnd 10: With right side facing, join Shaded Yellows with sl st to any ch-6 sp, ch 3 (counts as first dc now and throughout), (4 dc, ch 3, 5 dc) in same sp, * (5 dc, ch 3. 5 dc in next sp; rep from * around; join. Rnd 11: Ch 3, (dc in next dc) around, working Shell2 in each ch-3 sp; join. Finish off Shaded Yellows and weave in ends. Rnd 12: With right side facing, join White with sl st to any ch-3 sp, sc in same sp, * ch 7, sc in next ch-3 sp of next point; rep from * around; ch 7; join. Rnd 13: * Ch 6, sc in next ch-7 sp, ch 6, sc in next sc; rep from * around, ending with ch 3, dc in same st as joining. (Brings thread in position for next rnd). Rnds 14-16: * Ch 6, sc in next ch-6 sp; rep from * around, ending with ch 3, dc in dc. Rnd 17: * Ch 7, sc in next ch-6 sp; rep from * around, ending with ch 7, sc in dc. Finish off and weave in ends. Rnds 18-23: Rep Rnds 10-15 once. Rnd 24: * Ch 6, sc in next ch-6 sp; rep from * around, ending with ch 6, sc in dc. Finish off and weave in ends. Rnd 25: With right side facing, join Green with sl st to any ch-6 sp, * ch 5, sc in next sp, ch 7, sl st in top of sc just made (picot), ch 7, sI st in same sc, ch 7, sI st in same sc (3 picot cluster), ch 5, sc in next sp, rep from * around, ending to correspond. Finish off Green and weave in ends. Rnd 26: With right side facing, join Shaded Yellows with sl st to any single sc, * ch 4, sI st in 1st lp of next picot-cluster, ch 3, sI st in next lp of same picot-cluster, ch 3, sl st in same loop (picot loop), ch 3, sl st in next loop of same picot-cluster, ch 4, sl st in next sc; rep from * around; join. Finish off Shaded Yellows and weave in ends. Rnds 1-15: Rep Rnds 1-15 of Center Doily. Rnd 16: * Ch 6, sc in next ch-6 sp; rep from * around, ending with ch 6, sc in dc. Finish off and weave in ends. Rnd 17: Rep Rnd 25 of Center Doily. Rnd 1: With right side of Motif facing, join Shaded Yellows with sl st to any single sc, ch 4, sI st in 1st lp of next picot-cluster, ch 3, sI st in next lp of same picot-cluster, ch 1, join to picot-loop of any scallop on Center Doily, ch 1, sl st in same lp on Motif, ch 3, sl st in next loop of same picot-cluster, ch 4, sl st in next sc on Motif; * ch 4, sI st in 1st lp of next picot-cluster, ch 3, sI st in next lp of same picot-cluster, ch 1, join to picot lp in middle of next scallop on Center Doily, ch 1, sl st in same lp on Motif, ch 3, sl st in next lp of same picot-cluster, ch 4, sl st in next sc on Motif; rep from * once, ** ch 4, sI st in 1st lp of next picot-cluster, ch 3, sI st in next lp of same picot-cluster, ch 3, sl st in same loop (picot loop), ch 3, sl st in next loop of same picot-cluster, ch 4, sl st in next sc; rep from ** around; join. Finish off Shaded Yellows and weave in ends. Work a 2nd Motif in same manner and having Center Doily to top of work, join center of 2 scallops to center of 2 scallops on left hand side of 1st Motif leaving 2 scallops free at inside edge of 1st Motif, then work 2 more scallops on 2nd Motif, leave 3 scallops free on center, join next 3 scallops of Motif to next 3 scallops of Center Doily joining same as 1st Motif was joined. Join 6 more Motifs in same manner always leaving 3 scallops free on Center Doily between joinings and 2 scallops free on inside edge of each Motif. Join last Motif to 1st Motif to correspond. ch 3 (counts as first dc), 14 dc in ring; join with sl st to first dc. (15 dc) Finish off Green and weave in ends. Attaching Small Motifs to Center Doily. Rnd 1: With right side of Small Motif facing, join Shaded Yellows with sl st in same st as joining, sc in same st, * ch 5, sl st in top of sc (picot), ch 3, working on Doily, join to picot loop at center of 1st free scallop, ch 3, sl st in same sc of Small Motif, ch 5, sl st in same sc, sc in next 3 dc, ch 5, sI st in top of last sc (picot), ch 3, working on Doily, join to picot loop at center of next free scallop of same Motif, ch 3, sl st in same sc of Small Motif, ch 5, sl st in same sc, sc in next 3 dc; rep from * once, but joining to center picot loop of 2 free scallops of next Motif, ch 5, sI st in top of last sc (picot), ch 3, working on Doily, skip next scallop, join to picot loop at center of next scallop, ch 3, sl st in same sc on Small Motif, ch 5, sI st in same sc, sc in next 2 dc; join with sl st to first sc. Finish off and weave in ends. Attach a Small Motif in each of the next 7 spaces around Center Doily. 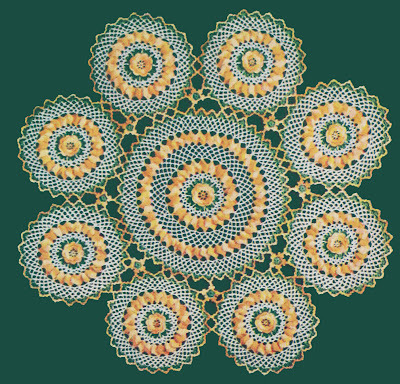 I made 3 of this doily in 1953 for gifts. I didn’t find it hard. 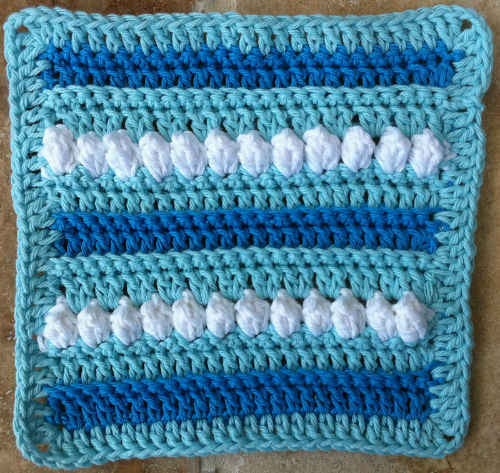 But the blocking took a bit. It is well worth the trouble making. I like putting myself out there and getting to know all of you online. I like being one of the faces of crochet.